The Apollo e-cigarette is well received in the marketplace thanks to its high-end appeal and reputation for high quality. While not quite as popular as some other brands, it does provide considerable advantages by doing all of their research and development in house. Apollo Electronic Cigarettes have been able to produce their own line of devices and e-liquids to try and cater to the demand at competitive prices. Apollo continues to improve the electronic cigarettes they offer and have broadened their product line to include great accessories, eGo type e-cigs as well as their own MOD Personal Vaporizer for those who wants the best and most powerful type devices. In this specific review, we will mostly only review the traditional electronic cigarette models, but check out our MOD reviews for the more advanced models. 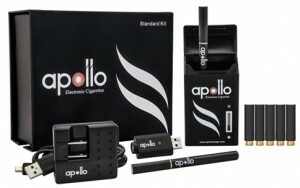 The Apollo electronic cigarette is definitely in the premium category. We will breakdown the Apollo and judge whether it is really worth the price. Use Coupon Codes At Checkout By Clicking ‘Visit website’ Below For Our Exlusive Discounts! Apollo E-Cigs offers a good overall value and options for more advanced type eGo batteries to advanced personal vaporizers, something to please everyone. There is little doubt that the overall design of the e-cigs and starter kits remarkably nice. We have to take our hats off to Apollo for creating one of the best looking, most attractive versions of e-cig products currently available. While the overall packaging is a well presented, the e-cigs themselves perform very well. There is the standard LED light to let you know how much battery life is left. The design of the e-cigarette does not offer anything extraordinary. It is very traditional in design and function. Their portable charging case is a very nice addition. A nice LED power indicator to let you know when to charge with an internal battery that will give your 3-5 charges on the go. It resembles a traditional pack of cigarettes but is actually slimmer than most other similar e-cigarette portable charging cases we came across. Fitting it a little easier in your pocket is always a plus. However, the differentiation is that Apollo has everything done in house. From development and to production of e-liquids, Apollo has their own factory and production lab with qualified chemists, making safe high quality e-liquid flavors. Being that they do all of the work themselves, quality control is high and we can safely say Apollo has a great e-cigarette that will be enjoyed by analogue cigarette smokers due to the solid performance and vapor production that we will cover next. The vapor quality of the Apollo e-cigs is really outstanding compared to most brands. It very much feels like real smoking and if a concern of yours is vapor amount, you will be satisfied with Apollo. It took very little effort to draw out a substantial cloud of vapor from each e-cig. The quality is enhanced by the flavors as well which are well blended. Apollo e-cig places the air vents at the base of the battery and four air vents around the cartomizer as well. This way, your fingers do not cover up all the vents so that the vapor flow is more even and controlled. Some of the flavors do die out faster, it’s hard to say really because among ourselves, we had mixed reviews. Overall, it’s more fair to say that flavor starts diminishing but remains present until the end. It’s on par with some of the best cartomizers and vapor does not diminish too much until the end. With all the quality advantages of the Apollo, batteries are are part of them. The standard 180mAh Apollo electronic cigarette battery will last for a few hours all depending on your vaping frequency. They consistently last 4-6 hours. Having two batteries will also ensure you will be able to vape for a full day. Charging the battery was quick and usually takes 2 hours or so when using the wall charger. They are on par with all the top e-cigs but will beat out the cheaper brands that usually get dull power after only a couple of hours.You can also upgrade to the Extreme battery that is slightly longer but packs 280mAh for longer duration matched with Apollo Extreme cartomizers. Each model is available in both automatic or manual to preference. Manual has a button on which you need to press to activate the heating element. Let’s keep in mind that Apollo offers a much more advanced array of batteries that you can see in the image below, however, for the sake of the review, this one will focus on the traditional styled e-cigarettes only. There are more than 30 flavors available for the Apollo line of e-cigs. Apollo distinguishes themselves from lots of competitors by developing and manufacturing their own flavored e-liquids. They claim to have experienced chemists blending the flavors to perfection, and we attest that they have very bold and tasty flavors. Overall Apollo has some really great flavors and do recommend them. There are plenty of flavors to choose from and each offers their own, unique kick. For overall variety, we can put Apollo near the top of the list of all e-cig companies especially when it comes to the intensity and formulation of the flavors. 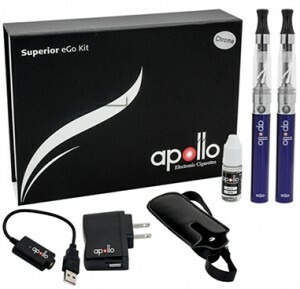 Apollo Electonic Cigarette Starter Kit prices are among the more affordable brands. They have fair and competitive prices. The cost gives a good bang for your buck value wise and we don’t think you would be disappointed with them. However, Apollo shines once again with customer service and satisfaction assurance. They offer a 30 Day money back gurantee, so for any reason you are not fully satisfied, you can return the kit for a full refund. They offer Free Shipping on all orders over $30 and a limited lifetime warranty on all electronic devices, a good way to protect your investment. Although limited, in some ways it does provide an excellent way to replace old and worn our parts. The cartridges, cartomizers, and clearomizers are covered under a two week warranty. All disposables and e-liquids are not covered by any warranty. Live chat and phone support is quick to answer as we’eve tested ourselves. 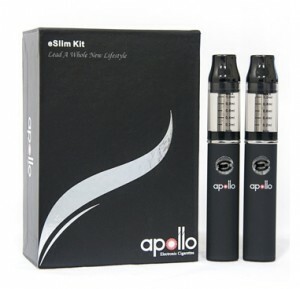 For an in-depth look at Apollo Starter Kits, visit our full Apollo Starter Kit Review here. eGo Electronic Cigarettes are more advanced, usually offering extended battery life, and better vapor performance. Once we test these, we will do a full review on them to give you more information. Similar to the eGo Apollo e-cig, the eSlim offers something out of the box, with a comfortable grip and compact size, will offering longer battery duration and better vapor production as well. The Apollo VTube Kit V3.0 is their most advanced flagship personal vaporizer MOD. It is possibly the solution for the heavy smoker that has been unable to find a device that satisfied them. It also caters to a growing market of vaping aficionados who want what’s best. Check out our full review on the Apollo VTube V3.0 to get more information on this little beast of a vaporizer. For those looking for single use smokeless cigarettes, Apollo also offers a disposable e-cig model. Although limited in flavor and nicotine volume like most other disposables, they offer Watermelon flavor, which is my personal favorite. For that reason I still buy Apollo disposables from time to time for small trips or to gift my friends with. 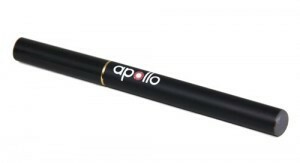 Check our full Apollo Disposable E-Cigs review here. 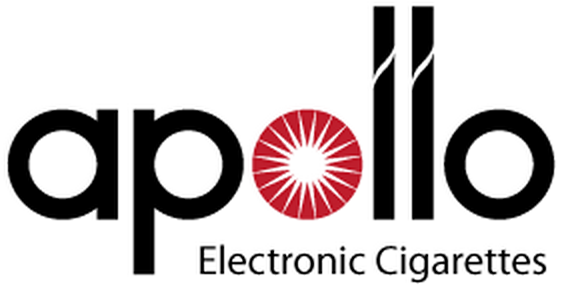 Apollo Electronic Cigarettes impressed us in many way. The overall design, packaging, variety of flavors, vapor flow and warranty are certainly highly impressive and definitely makes the Apollo brand one of the better choices in the modest price range. In fact the vapor production was so good on the basic models, that it has to be one of the best choices in this price range. Additionally to offering traditional e-cigarettes, they have their own eGo, eSlim and VTube MOD models to offer great upgrades and new experiences for current vapers. Overall, we were highly satisfied with the Apollo vaping experience and its certainly a good value at current prices. For those who are looking at getting a high quality brand without breaking bank, Apollo is worth considering.